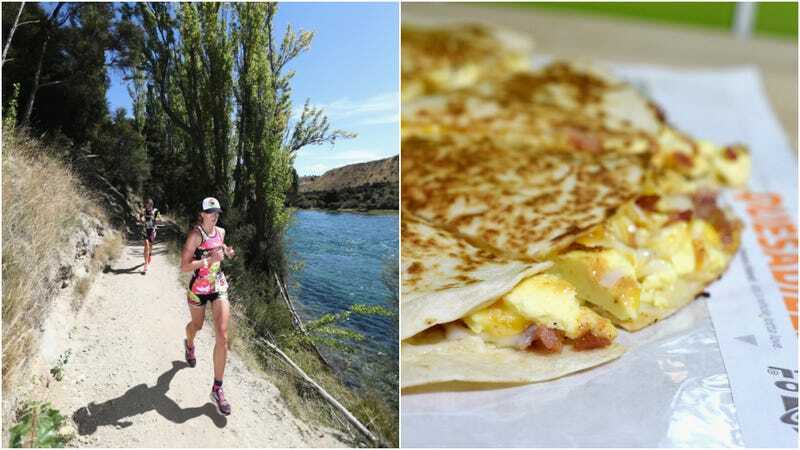 Alyssa Godesky runs in the 2017 Challenge Wanaka in February 2017; a Taco Bell quesadilla. Competitive long-distance runners can be particular about their preferred brand of energy gels, the electrolyte- and amino-acid-packed goop that sustains them on long runs. I like running, but I do not like energy gels. So I found a hero in professional triathlete Alyssa Godesky, who this summer shattered the record for the 273-mile Vermont Long Trail after eating a Taco Bell quesadilla en route. Bravo. Was the quesadilla entirely to thank for her record time of 5 days, 2 hours, and 37 minutes? (She slept just 18 hours total during that time, averaging about 55 miles per day.) No, it was probably the years of ultramarathon running, triathlon competition, and intense training. But who’s to say that greasy cheese pocket didn’t help in its own way?